EEEeeep! I feel like I’ve been slacking. And since I have only six subscribers… I didn’t really think anyone would notice. That is until I caught wind of the fact that one of my most avid readers (my grandma) has been not-so patiently waiting for my next post. Wooops. Things have been busy, Grandma! Girl’s gotta work… But that’s no excuse! I’ve already failed at my baking bucket list-one recipe a week, PFT! However, I did a bit of midweek baking this week and I’ve been meaning to share, so here we are. These peppermint patties were delicious! Everything tastes so much better when its home made, no? These cookies are not only my mother’s favourite but also that of a lovely lady I work(ed) with. She just left the company, and as a farewell present I made her these deliciois treats. They were a hit, so now I just have to clean up my chocolate coating techniques and perfect them for when my mother visits in December. Did you know that the Peppermint Patty of Peanuts was named after these cookies? Kudos to you if you got the reference in my title. Marcie alwasy called Peppermint Patty ‘Sir’. I think they were lesbians. But that is neither here nor there… Lesbian or not, Patty is definitely the most delicious when peppermint. As with any mint-chocolate combination these bad boys taste best straight out of the fridge or freezer. They’re perfect for any season too! Summer, Winter… it doesn’t matter. The best part was… no oven required. Simply mix, refridgerate and coat in melted chocolate. Combine the confectioners sugar, corn syrup, water, peppermint oil and coconut oil. You can use a hand mixer, but I have limited kitchen tools, so my efforts were all man power. It took a while to come together, but it did. I added a bit of extra water, which may have been a mistake. Just work at it. Sprinkle some confectioner’s sugar on your counter top and knead the dough until smooth. Roll it out between to pieces of parchment paper and place in the refridgerator to firm up. After about 20 minutes, peel off one side of the parchment and sprinkle the dough with somre sugar. Repeat on the other side. Cut out one-inch rounds and set aside… preferably back in the fridge to keep them firm. I used a shot glass as a cookie cutter. It was the perfect size. Allow them to set in the fridge until the chocolate is firm and then eat them. Lots of them. Absolute cuteness! 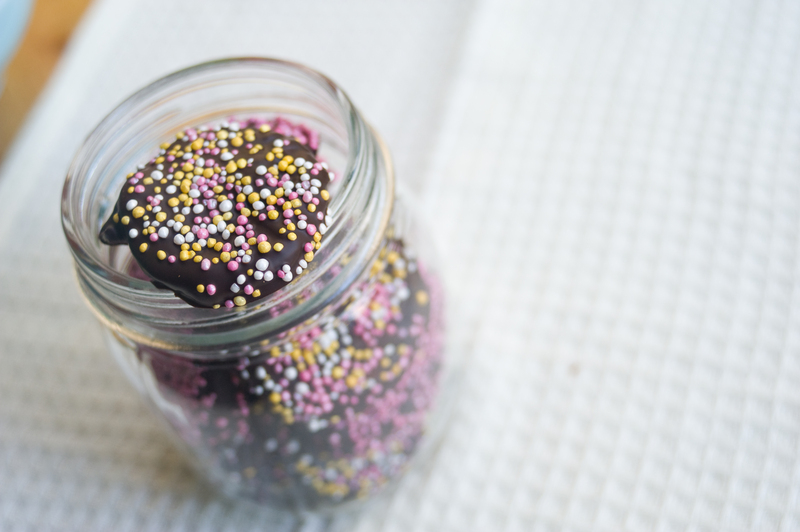 I adore peppermint patties, and the sprinkles add just the sweetest touch. You have the most wonderful writing style! I loved your post lots, and im sure you will have more than 6 subscribers after people check this lovely post out 🙂 Gorgeous recipe and photos, am going to have a wander around the rest of your blog now and you have another loyal follower in me! These look delicious! I could definitely go for a nice peppermint patty right now. The sprinkles are cute and I can see using different colored sprinkles for different holidays. I work in a bakery and whenever we make something that doesn’t look quite right, we call it ‘rustic’ although to tell you the truth, I don’t really see anything wrong with your chocolates. Keep on blogging. I’m sure your traffic will increase thanks to this recipe being featured on TasteSpotting! I’ll definitely be back. These looks so adorable….especially in the mason jar! 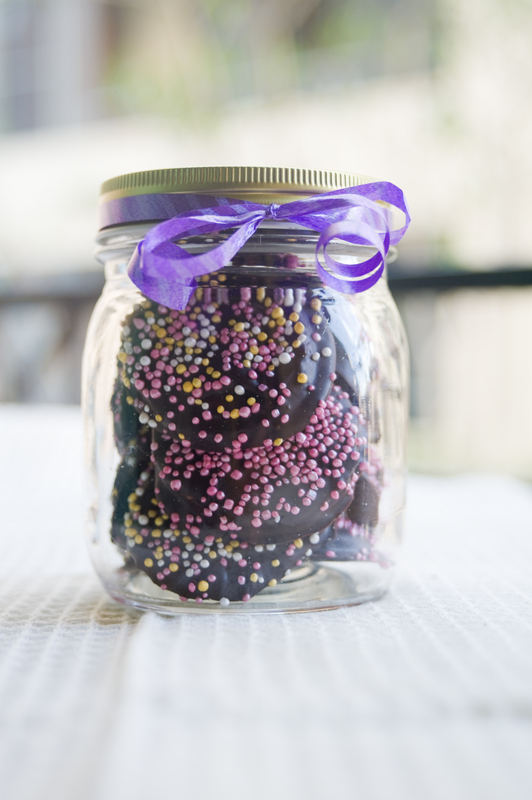 I love the idea of a cool peppermint pattie made by my own two hands! Splendid! That’s wonderful. 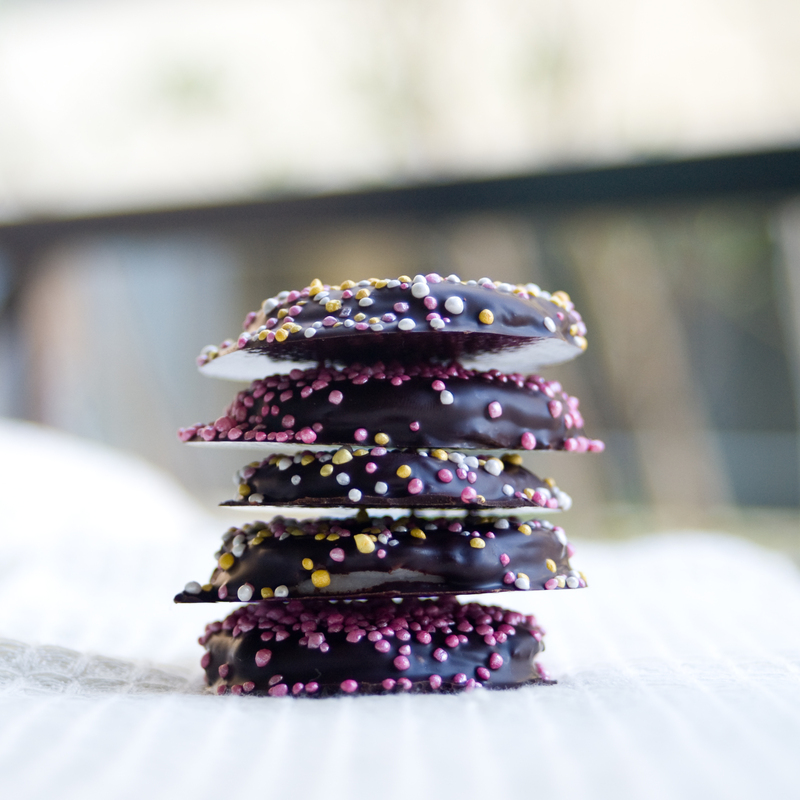 A peppermint patties that looks so sweet. Peppermint patties are one of my absolute favorite candies. Thanks for sharing the recipe! Just found these on foodgawker! Perfect timing too, the girl I just started dating is vegetarian and doesn’t eat gelatin. 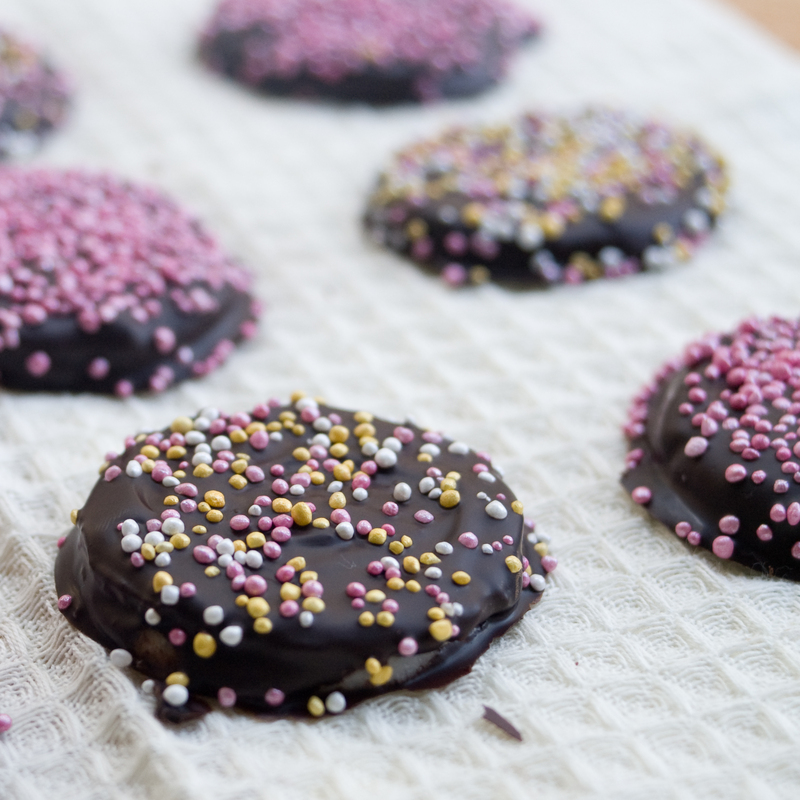 She mentioned how much she missed peppermint patties, so we are making these tonight. Thanks!